The reason that this deck is so extraordinary is that the images are based on 3-dimensional works of art, designed by Helen Jones. A lot of bronze, gold and silver colors are used, that make the cards look very rich. Every card shows a beautiful scene against a bright-colored background. Each suit has its on background color, red for Wands, light-blue for Cups, purple for Swords, and green for Pentacles. In contrast to the rich colors, this deck is the most calm and peaceful deck I have ever seen. Since the cards look so calm, they could seem "simple", but the cards are filled with symbols. The cards contain all kinds of symbols, including mythological symbols from ancient Egypt, Greece, and Rome. The peacefulness of the cards is enhanced by the expression of the persons on the cards. There are no sad or angry faces, and only a few faces that smile, most faces look serene but confident. 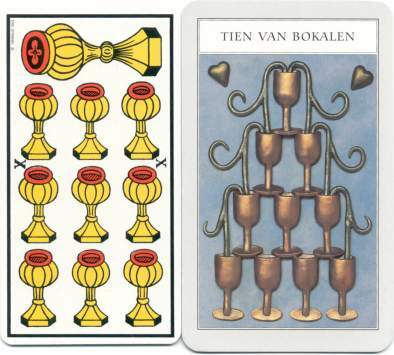 Renaissance 10 of Cups (right) The Minor Arcana cards show the most similarities to the Tarot de Marseille, since a lot of them mostly show the elements of the suit. For instance, let' s take a look at the 10 of Cups from both decks. The 10 of Cups from the Tarot de Marseille shows 10 Cups, arranged in a symmetrical pattern. The Renaissance 10 of Cups also shows 10 Cups, but in a very different form. The shape is that of a pyramid, reaching the top of the card, and the Cups seem to be overflowing. According to the book, the pyramid symbolizes a peak in an emotional cycle, and flowing from the Cups are the waters of Love and Creational powers. Compared to this card, the Tarot de Marseille card looks dull and deprived of symbolism. 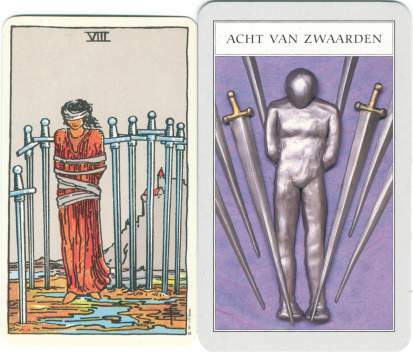 Renaissance 8 of Swords (right) But there are also Minor Arcana cards that show a lot of similarities with the Rider Waite, as we can see in the 8 of Swords. The scene in both cards is almost identical, but the Renaissance Tarot depicts it in a more simple but powerful form. The woman in the Rider Waite 8 of Swords could have been tied by someone else and could be unwilling to free herself. The person on the Renaissance card isn't tied with ropes, but with his own thoughts. According to the book, the card clearly illustrates that the "prison" the person is captured into, is self-created. The Renaissance card shows less details, but provides a fuller picture. Renaissance Lovers (right) The Major Arcana cards are deeply influenced by the Rider Waite Tarot, but some cards show interesting variances. Let's take a look at the Lovers card from both decks. The Rider Waite Lovers card shows Adam and Eve in the garden of Eden. 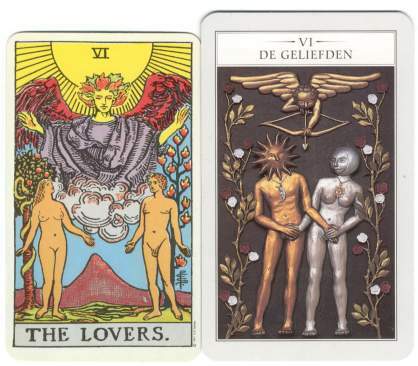 The Renaissance Lovers card shows a man representing the Sun and the Yin principle, and a woman representing the Moon and the Yang principle. So instead of only concentrating on love, this card talks about the opposite primal forces of life that need each other to form a unity. Because of the peace in the cards, this deck would be excellent for meditation and contemplation, especially after readings. The versatility of this deck makes it truly a work of art. Tarot card reading and online tarot reading - find out what it means by calling one our professional tarot card readers at 1-800-498-8777.